Made out of heavy gauge stainless steel sheet double walled, fully insulated in between top and sides. Construction: Unit's outer body made of 22gauge & inner chamber of 20 gauges S.S. Sheet double walled, well insulated, and mounted on 75mm dia. 4 casters & drain valve. Dimensions: Over all, approx.60cm x40cm x76cm. 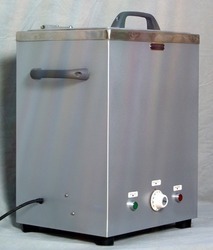 TE-5521 MOIST HEAT THERAPY UNIT Table Model. temperature.Made out of heavy gauge stainless steel sheet, double walled & well insulated in between. - Finish. : Polished finish inside. • Fully Constructed With Heavy Stainless Steel Material. The specifically designed Pack heating unit automatically maintain Hot Packs in water at proper temperature. Made out of heavy gauge stainless steel sheet, double walled & well insulated in between. The specifically designed Pack heating unit automatically maintain Hot Packs in water at proper temperature. airflow with CELLEX® media. This combiantion works to generate the mechanical effects of skin desensitization and limb buoyancy. Made out of heavy gauge stainless steel double walled well insulated in between 12 x 15 x 20 fitted with 2 KW heating coil pilot lamp and thermostat for heat coil with 4 bags of Silica Crystals. Medical grade stainless steel. available in differnt models according to the customer need. Strong and durable . best price in the market. DH-803 Deep Heat is smart, sturdy, lightweight ABS constructed body, is one of the most advanced and convenient infrared deep heat therapy systems of these times. Deep Heat therapy can create heat 2 inch or more below the skin surface into tissues and muscles which stimulates the body's metabolism in specific areas to burn targeted fat cells. 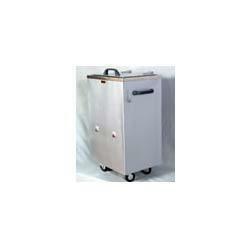 We are manufacturer of Hot Pack Therapy Unit.